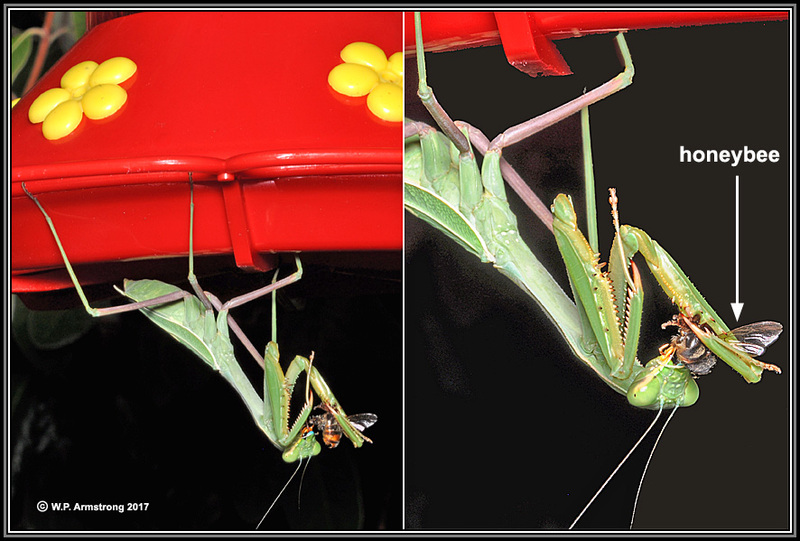 I don't think Miss Mantid is after the hummingbirds at my feeder. I think she is after the honeybees attracted to the yellow flowers. Honeybees do not see red as we do, it appears black to them! 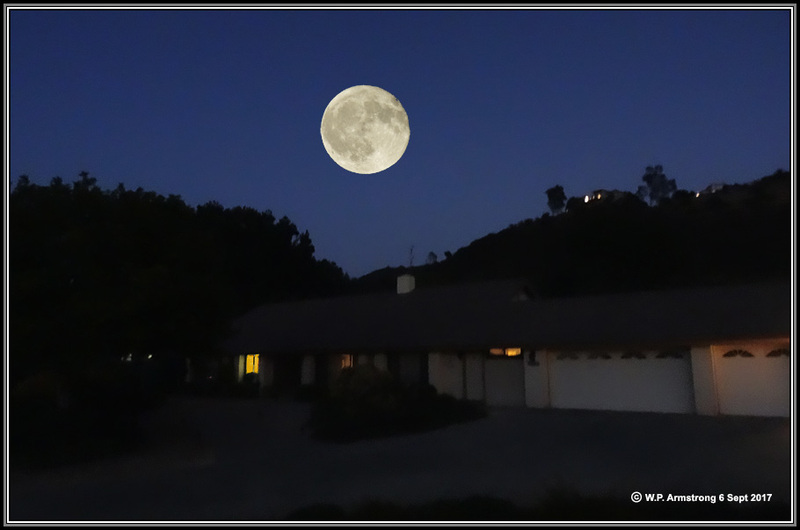 Last night's bright September moon over my home in Twin Oaks Valley is technically not called a harvest moon. This year's harvest moon will be October 5 because it is closer to the fall equinox (September 22). [# of days before or after fall equinox trumps month.] Last night's moon is called the corn moon or barley moon and still relates to harvest time! 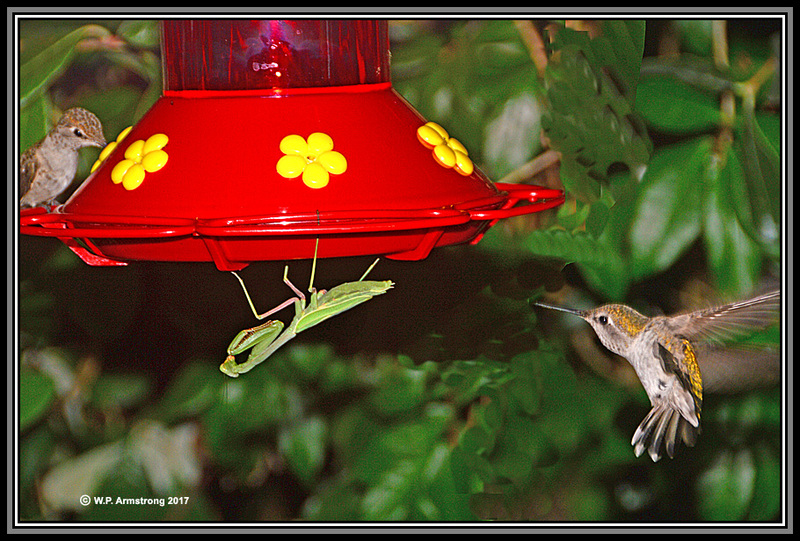 My hypothesis was correct: Miss mantid on my hummingbird feeder is catching honeybees. 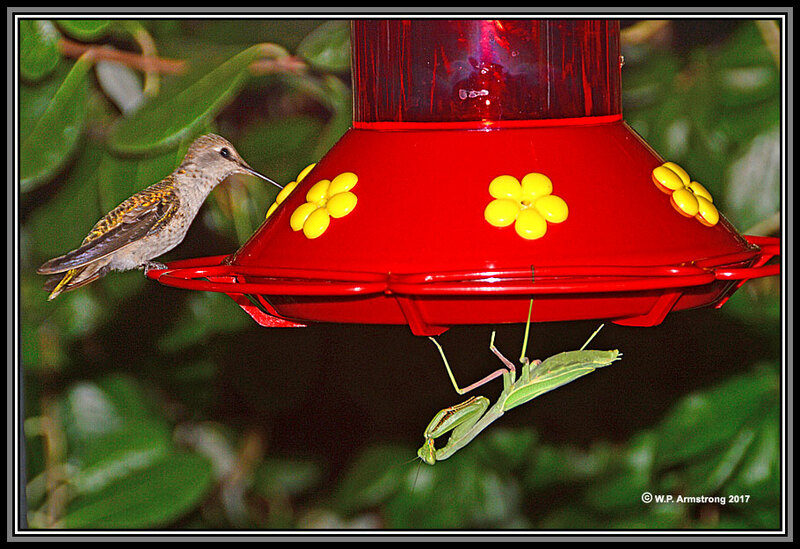 She is actually helping the hummingbirds by preventing the feeder from becoming overrun by bees! 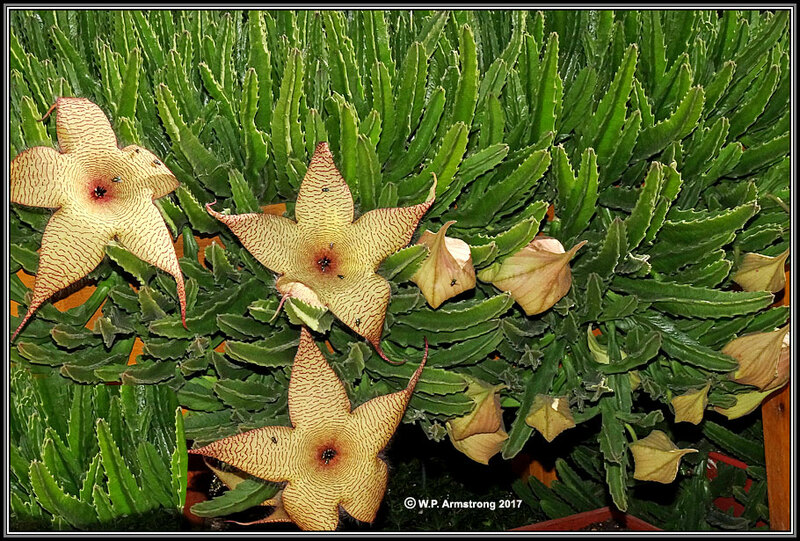 Starfish flowers (Stapelia gigantea) in full bloom at my home (21 Oct 2017). Some are 12 inches across. They emit the stench of carrion, attracting egg-laying blow flies that mistake them for dead mammals. The petals are even hairy in texture. More Images Of Stapelia Flowers. My Indian shot (Canna indica) are blooming. 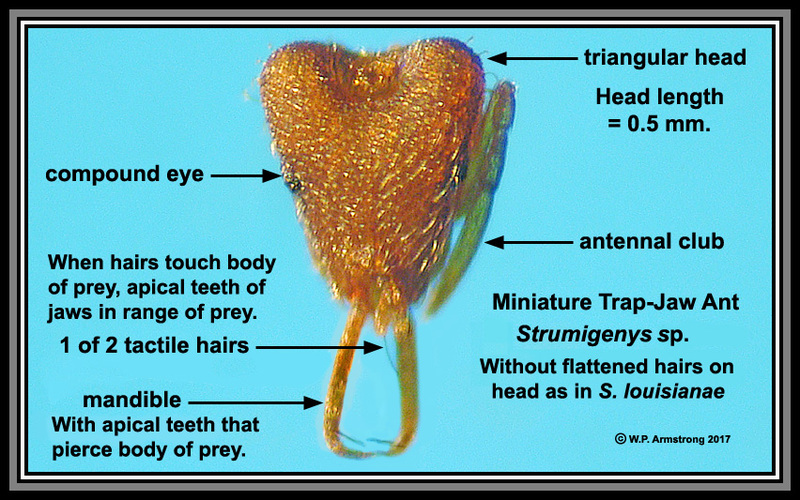 I collected the seeds on Tortola (British Virgin Islands) many years ago. 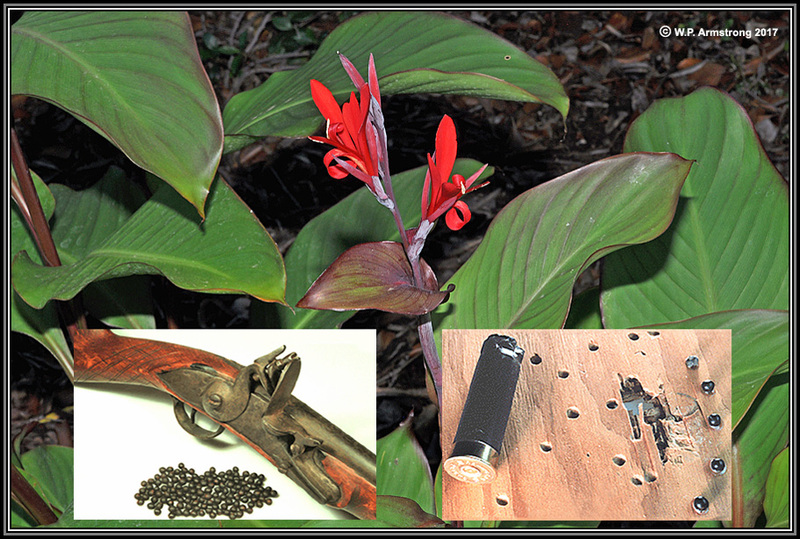 There are unconfirmed reports of the hard seeds being used in flintlocks when lead shot was in short supply. I tried them in a 12 gauge shotgun shell and they pierced quarter inch plywood! Seeds Shot From Guns?. 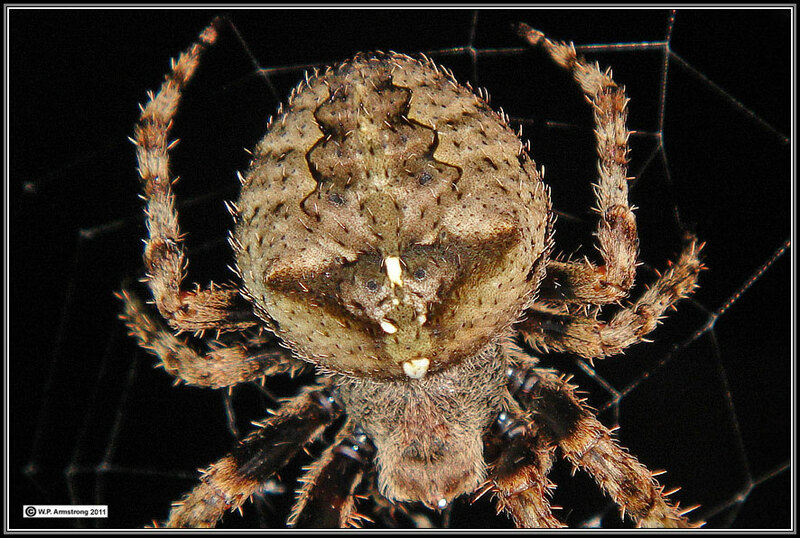 Last night I tried to photograph Neoscona orb weaver spiders in my yard, but I could not beat this older image taken in 2011. 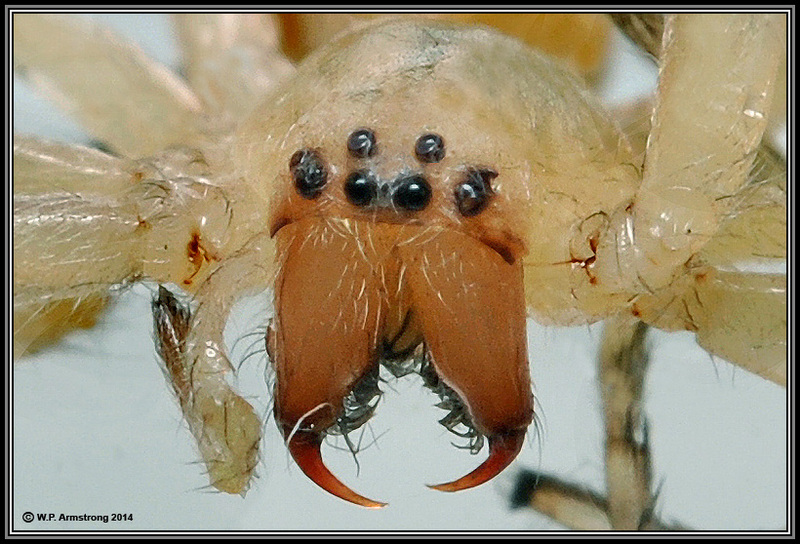 Some have amazing facial markings on their abdomens. 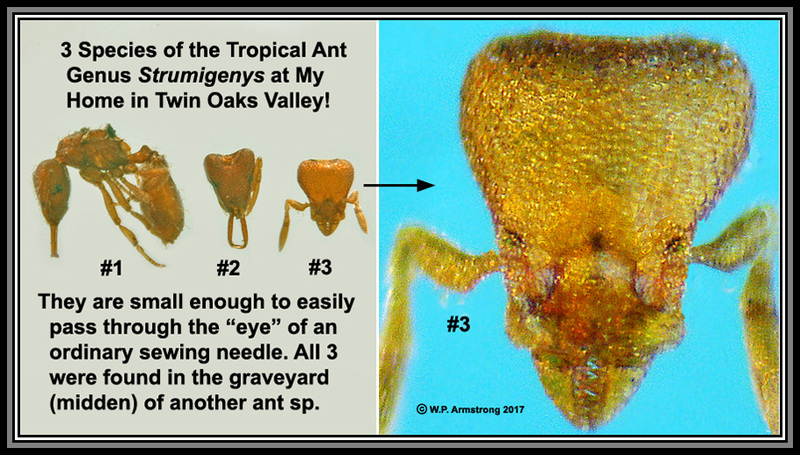 These large spiders are common in Twin Oaks Valley during the fall months. 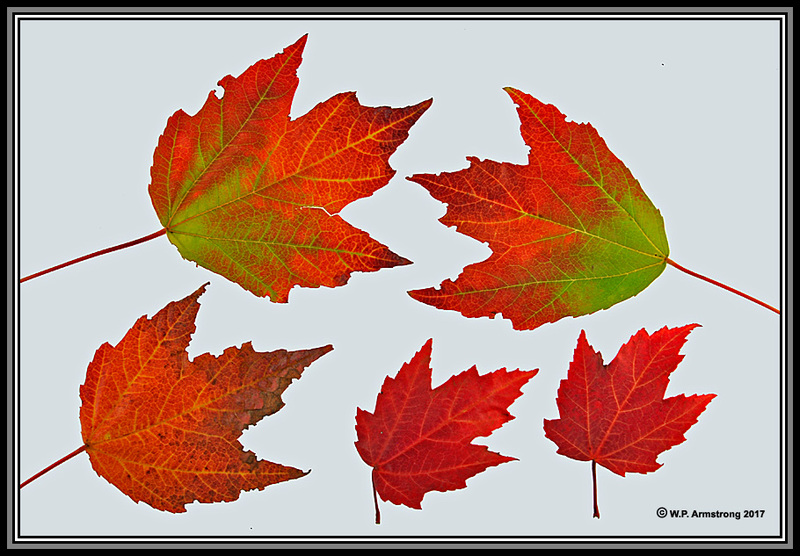 Frost Myth: This fall the leaves on red maple in the Palomar College Arboretum turned vivid red without cold weather. 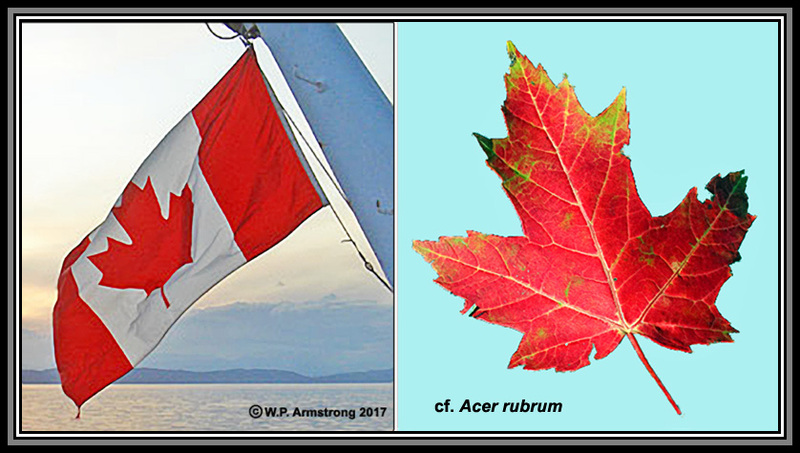 Leaf fall is a complex process involving day length (shorter days), hormones & the development of abscission layer at base of leaf stalk. Deciduous trees are genetically programmed to drop their leaves and prepare for winter. Red anthocyanin pigments replace green chlorophylls in the leaves. 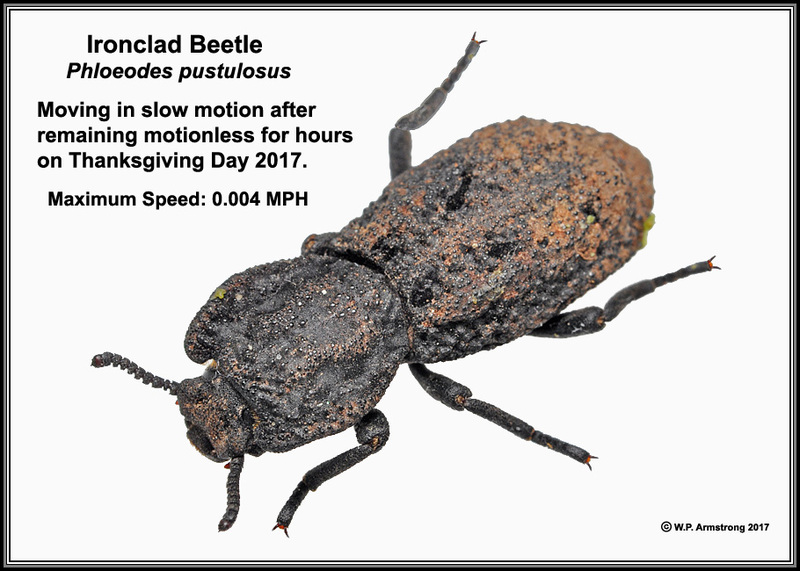 This beetle is a master in the art of playing possum. During our Thanksgiving party it remained motionless on the patio floor during our entire feast and games. I bet my grandson Jack that it was still alive. After no movement for hours I paid Jack the money. After everyone left that evening the beetle started moving again! According to Dr. Richard Minnich of UCR, fire suppression has led to huge fires in the fall fanned by Santa Ana Winds. 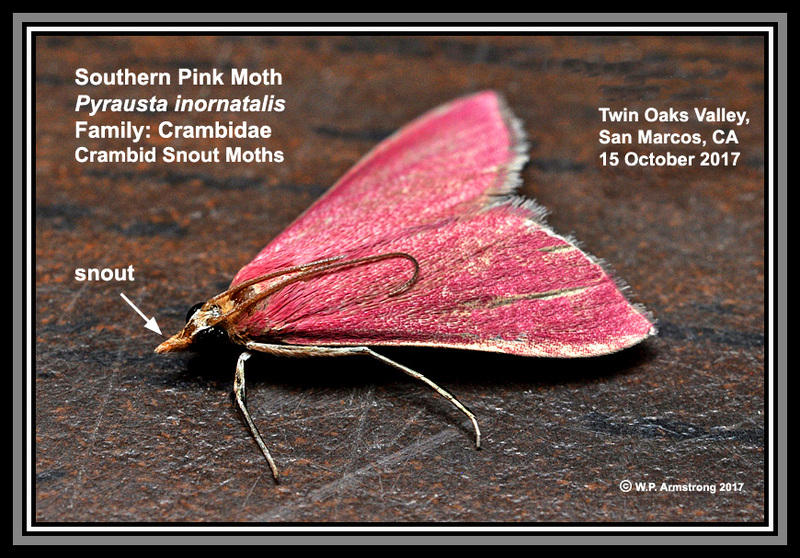 The California Chaparral Institute has an opposing view: See Myths 1 & 2 At This Link. 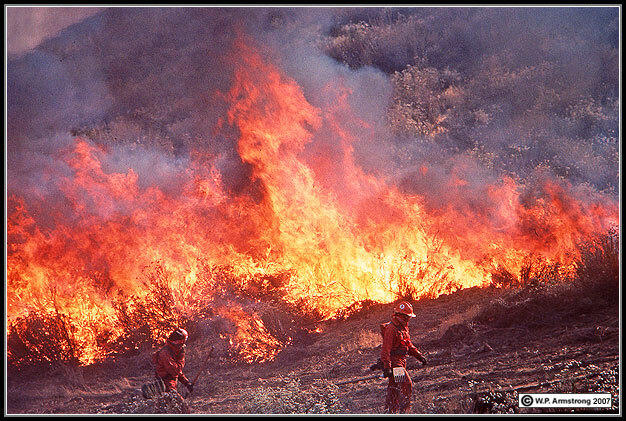 Given the proper climatic conditions (including lightning) fires are inevitable and they occurred long before people inhabited this area. In fact, they are a major factor in the exfoliation of granitic boulders and age-dating of bedrock surfaces. See Ashes To Wildflowers. Just as housing developments should not be built in flood plains, they should not be built in known chaparrral "fire corridors". Raging fires in these areas pose a serious danger to residents and firefighters. 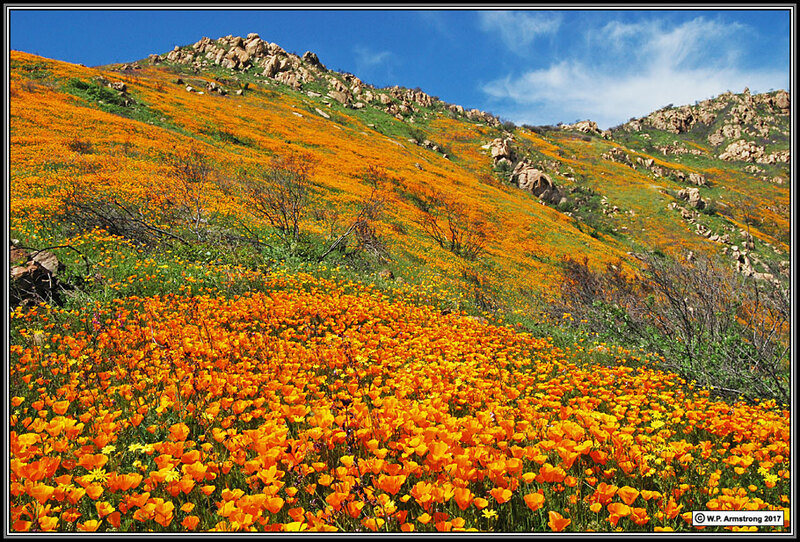 Nature's promise of renewal: Spring in San Diego County 2008: Hillsides of California poppies (Eschscholzia californica) above Lake Hodges following the 200,000 acre Witch Creek Fire of the previous October. See Ashes To Wildflowers.